Current and Future Artist Diego Enjoys the Tynker Community! Noah Fuses Music and Art With Coding! Coding Prepares Joshua For His Dream Job! Eleven-year-old Diego is in 6th grade and lives in San Jose, California. He likes drawing and watching cartoons like Adventure Time and Regular Show. 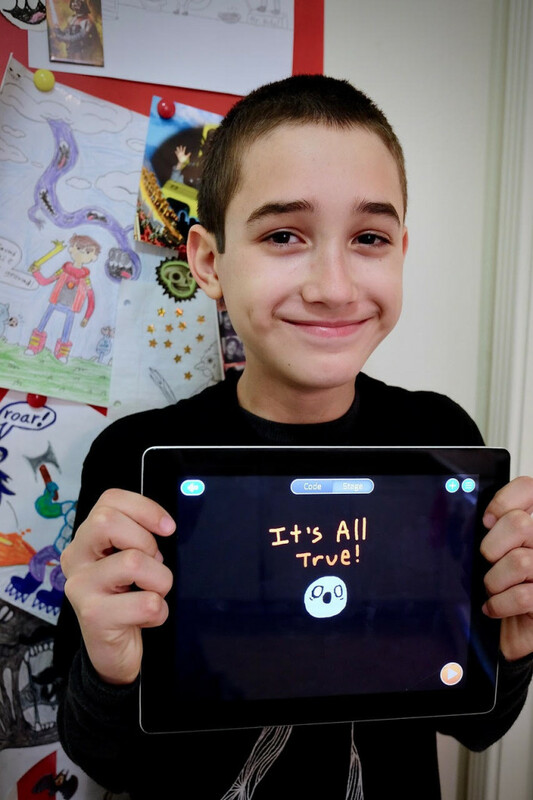 He coded a fantastic project called “Two Scary Stories” that we loved, so we chatted with him to hear what he thinks about coding. What’s your favorite subject in school? Either math or PE. Math is just kinda fun, I just enjoy it. What do you want to be when you grow up? An artist, like a cartoon artist. How did you figure out how to code in Tynker? By following the tutorials and just messing with the blocks. How long have you been using Tynker? About a year. Is there anything you’re working on currently? Actually, yes. I just started something yesterday. It’s like a knockoff of Pokemon called Pokemans, and they’re gonna be all weird and crazy looking. What’s something you want to make but don’t know how to? I want to make more of an animation with actual talking and stuff, but I’m just not that prepared yet, animation-wise, so I’m practicing that. What do you usually do with projects when you’re done with them? If I publish them, I like to see how many people saw them, to see if people enjoyed them. I want to publish stuff that people enjoy. When I don’t publish them, I just like looking at them or playing with them, and then fixing little things. What is your favorite thing you’ve made? Two Scary Stories. Where do you get ideas for projects like that? I don’t know, they just pop into my head. But for Two Scary Stories, it was around Halloween, so I wanted to make something that went with that. Do you look at the Tynker community projects? Yeah, I like a lot of them. I like what people can do. Why do you like to code? I just think it’s fun and it’s a good way to express yourself. Do you think other kids should try coding? Yes, definitely. Once you get the hang of it, you can do a lot of cool stuff. You can make your own games, make your own shows, websites, anything. What advice would you give for kids starting out with Tynker? I’d say, do your best and practice as much as you can, and just enjoy it. We agree – coding fosters creativity while being a great skill for the future! Thanks for speaking with us, Diego and Owen. We can’t wait to play your Pokemans game, Diego!